SIGHTINGS: Spotted last night at a giant bash at Nobu: fashionista cuties Karen Robinovitz and Melissa De La Cruz. Karen was heard saying she’s “still exhausted” from her recent Bungalow 8 birthday party that would have made P. Diddy jealous. Apparently, she was wearing two million dollars’ worth of Harry Winston diamonds (including the 22-carat ring Whoopie Goldberg wore to the Oscars) and was constantly shadowed by a bodyguard named Lou who was straight out of a Scorsese film. Melissa, also fatigued from the fast track, just hosted an intimate dinner party at a swanky Upper East Side restaurant attended by trend-setting journos from New York magazine, The Observer, Allure, “Page Six” as well as the indefatigable Michael Musto–and as part of the gift bag giveaway, the whole crew is being flown to Miami to stay at a five-star resort favored by the likes of Will Smith. Asked how they managed to go from barely-known freelance writers to A-list celebrities in just fourteen days, they coyly spilled the beans: Marie Claire called with the assignment, and they simply begged, clawed, cried, borrowed, cheated, lied, stole, and bribed their way to fame. 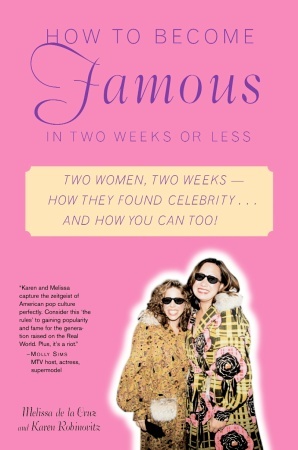 Their how-to tips to stardom include “Pick an M&M color to hate, and stick to it.” And they’re writing a book, daaahlings, so whether you live in New York or Nebraska, you too can have the goods to claim your own fame and become legendary.